Although it’s summer season now, but the days are still so unpredictable. Sometimes bright, light and full of sunshine, and sometimes dark with clouds and colder. Nature’s game: I am not blaming nature for all this haphazard. Nature is doing what it is supposed to do — it’s playing its own game. So the point is that this whimsical weather is demanding for some summery sunshine in terms of food to feel the warmth. And that calls for a salad which should be light, bright and summery. Guilt-free meal: For me, summer meal should be simple, full of fresh ingredients, and probably it should involve little or no cooking. And that’s one thing which I love about salads! They are so easy and eating them is so guilt-free. You can eat as much as you want. Whenever I eat it, it feels like a royal delight. Now let me tell you how I made this simple, fast, fresh, healthy and delish salad. The Dressing sense: I LOVE this simple dressing which I used for this salad. It’s slightly sweet, a little bit spicy and perfectly tangy. It really goes very well with the flavors and textures of this salad. 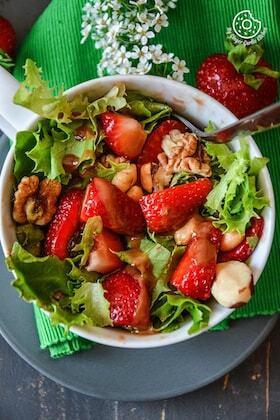 The dressing adds just the right touch to the salad without overpowering the natural sweetness of the fruit. I have added some honey to the dressing for sweetness and to help bring out the juices in the fruit. This dressing is simple — a little lemon juice, garlic, olive oil, salt, pepper, cilantro and honey. This salad is VEGAN DAIRY_FREE and GLUTEN-FREE too. Once you have the dressing ready, just add in all the remaining ingredients. And DONE! Kiddos will love this: Honeydew Melon Radish Salad Bowls are the perfect summer treat. Summer is one of my very favorite seasons. To all the Moms out there, if you are struggling to get your babies to eat their fruits and veggies then make a salad look fancy and interesting. They just love the simple things presented in fancy looking ways! :). 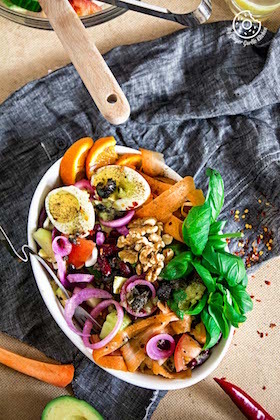 Magic in a bowl: This fruity-veggie salad works like magic. You tell me, who wouldn’t love a big, gorgeous melon salad bowl? I can eat them anytime of the year, but eating melons feels just right especially during the summer. Easy to customize: This salad is really easy to customize to your own taste. I used a combination of honeydew melon, cucumbers, red onions, cherry tomatoes and radishes. Then I simply used a melon baller to get those pretty round shaped honeydew melon balls. Half the fun of this salad is using the melon baller. Melon ballers are really easy to use but they do take a little bit of practice. Whatever melon you use to make it, it’s sure to turn out tasty and it makes the perfect pass-along dish at picnics and potlucks while you soak in the joys of summer. Shaping these balls is fun: To get perfectly round shaped balls, cut your melon in half and then press the baller firmly into the melon and scoop out a cute ball. And don’t worry if you don’t have a melon baller, you can still try this using a rounded measuring spoon. Refresh yourself with this blend of melon, radish, cucumber, and onions for a respite from the summer heat. Honeydew Melon Radish Salad Bowl is an easy, fast, fresh, healthy and delish salad. The Dressing is slightly sweet, a little bit spicy and perfectly tangy. It really goes very well with the flavors and textures of this salad. The dressing adds just the right touch to the salad without overpowering the natural sweetness of the fruit. I have added some honey to the dressing for sweetness and to help bring out the juices in the fruit. This is VEGAN DAIRY_FREE and GLUTEN-FREE too. Combine honey, lemon juice, olive oil, salt, pepper, garlic and cilantro. Whisk well. Cut melon in half, remove and discard seeds and scoop flesh with a sharp 1-inch melon baller. Hollow out the melon shell completely. Cut cucumber slices with a flower cookie cutter. That's completely optional. Add melon balls, cucumber flowers, onions rings, radish slices, tomatoes to a large serving bowl. Keep the salad in the refrigerator until you are ready to serve. To serve place the salad in the melon bowl and sprinkle with chili flakes, and add some almonds. Enjoy!